Posted on March 16, 2013	by . 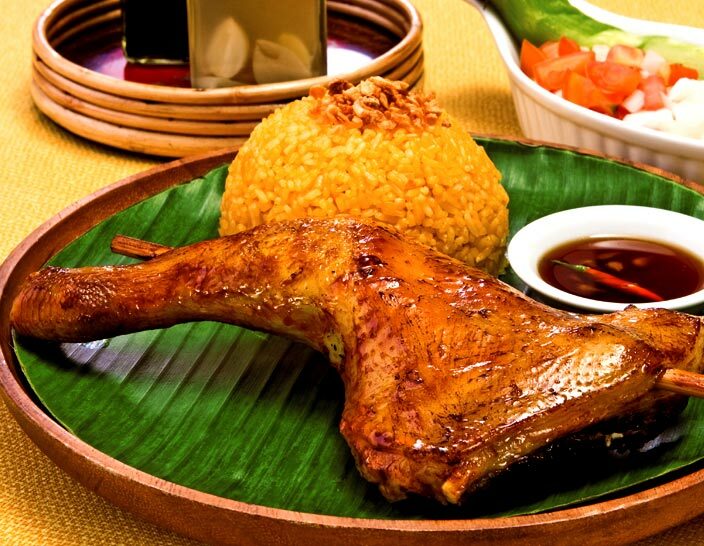 Bacolod City’s Chicken Inasal is a popular dish from the City of Smiles. It is not marinated or prepared like the usual chicken barbeque found in the rest of the country. The marinate does not make use of soy sauce and consists of other ingredients to create a unique flavor found only in this part of the Philippines. There are different variations to this dish’s preparation. Watch the 2 videos below too, to see how some locals prepare it and how you can substitute ingredients when cooking it abroad. Here is one way to marinate it (recipe). After marinating the chicken, put several slits on the part near the bone to help with cooking the meat fully. Skewer the meat and cook over hot charcoal grill, skin side down, basting it once in a while. As much as possible do not turn the meat more than twice since the result will be drier meat. * You can use whole chicken and roast it in the oven. Make sure that when you marinate the meat, rub the mixture all over the chicken including in the cavity. Watch the 2 videos below to see different ways to prepare this dish. There is the local “Bacolod City” way, and the “Western” way to marinate and cook it when you are not able to get local ingredients for it. This entry was posted in Bacolod City Cuisine, Video and tagged Bacolod CIty Cuisine, Centrale Bacolod Video, Video. Bookmark the permalink.